Some random bits of information posted whenever I get some free time. Probably not that often. I came across a post on the excellent Linocut Friends Facebook group recently. A relative newcomer to printmaking was asking if it was okay to hand colour her black and white prints. There was plenty of positive feedback, but one or two people felt that such a practise was not 'real' printmaking, or indeed 'cheating'! I have met this attitude often over the years and it bothers me a little. I believe that the most important think for any artist is to make an image that is the best that they can achieve at the time and given the circumstances. How they get to that image is not the most important aspect, assuming that no animals or humans were harmed along the way. There are, and have been, some really excellent printmakers who make prints with the intention of hand colouring them. 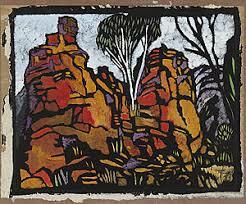 Margaret Preston (1875 - 1963) was a well respected Australian printmaker who made some really lovely prints, and enthused future generations of aussie printmakers. I think it is good to be open to all ways of making prints. We may not choose that particular path ourselves, but it is good to respect work that is made sincerely, to the best of the artist's ability, whatever the method. 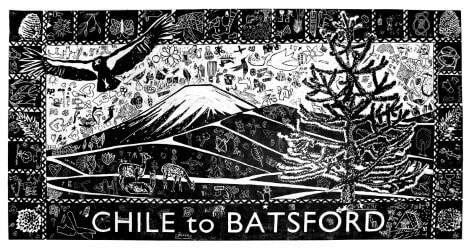 Have just returned from Batsford Arboretum, where Christine Felce and I have been doing a giant lino project with members of the public of all ages. This was lovely to do, so many people got really involved and I am sure some of them will become lino printers in the future. the project was to highlight Batsford's role in the conservation of tree species. They are a seed bank for the monkey puzzle tree from Chile, which is under increasing pressure in the wild.